Photographs by Shelby Lee Adams. University Press of Mississippi, Jackson, 1998. 128 pp., 80 duotone illustrations, 11x8½". First edition and first printing. Near Fine condition (light rubbing to cover, otherwise Fine). 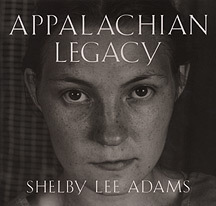 Appalachian Portraits, Adams's previous, acclaimed monograph, was only the beginning of his study of the Appalachian homeland. In images as revealing and complex as those earlier photographs, Legacy is a collection of images that he has made for nearly twenty-five years visiting the same nine families. The accompanying text relates their stories and Adams's relationship with them.